Sometimes we get the weirdest emails. 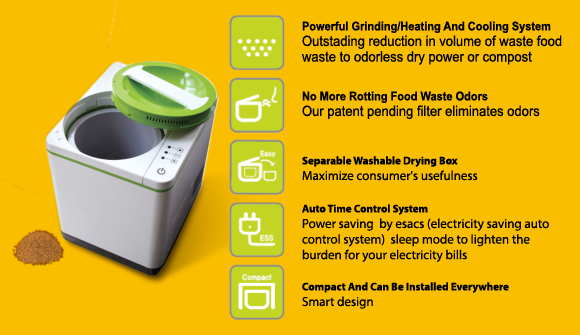 For example, a few weeks ago someone asked me if I wanted to try the Smart CARA (the Food Cycler in the U.S.), a Korean composting machine that turns food waste into healthy, usable potting soil in about four hours. As a sometimes gardener with a real composter in the back yard, I wondered why anyone would need one of these machines, so I asked to try one. First, I had no idea these things even existed. That you’d need a machine to do small batch composting in the privacy of your kitchen is an alien concept, akin to having a pet embalming studio in your bedroom. But that it works is equally surprising. It basically makes it easy to make healthy, homemade fertilizer without the mess of worms and offense of the resulting “compost tea” that I usually have to pour out every year after a long winter of garbage marination. While you can always dig a hole in the ground and throw your banana peels into it, if you don’t have any available ground this is definitely the next best thing. I could also imagine a line of CARA rice cooker/composters that allowed you to cook and then instantly digest food during the day, to save you the trouble of eating it yourself. But maybe that can be their next product. For some reason a Canadian company called Food Cycle Science tried a failed Indiegogo campaign to offer pre-orders of the U.S.-based device. They were selling it for $399 and I suspect they’ll put them back on the market shortly. At one cubic foot it’s about as big as a larger coffee maker, so make sure you have lots of space before you invest in one. However, for an apartment dweller with lots of plants or someone who just can’t bear to throw away a banana peel, this may be a very clever and fascinatingly high-tech solution.